Facing Fear with Fun After Dark! Summer nights are inviting. The air is warm, the breeze is gentle, and a natural world unique from the nights offered in fall, spring, or winter, awaits our exploration. For young children, being outdoors at night is filled with exciting after-sunset opportunities to learn and play with friends and family. But we know–all too well–that when children are afraid of the dark, nighttime play might feel like just too scary a proposition. What should we do to encourage kids to befriend the night and all its magical possibilities? For help answering this question, we turned to two outdoor play experts, Jennifer Ward, author of Let’s Go Outside, and Kristen Laine, an avid “outdoorsmom” who writes the “Great Kids, Great Outdoors” blog. Combining their wisdom, here are 10 simple and safe ideas for enjoying summer nights as a family, with special hints for helping kids feel more comfortable and confident after dark. It’s been another long, hot day, so why not take one more run through the sprinkler before bed? Trading the normal nightly bath routine for a fun and refreshing alternative not only helps kids cool off (which, in turn, helps them sleep better), but comes with another bonus: most gardening experts recommend watering grass at night for maximum efficiency. Think of it this way: happy kids, happy grass! Since this activity is focused on playing with a familiar object, children who are afraid of the dark might not have too much of a problem with this one. As a way to visually remind children that they are not alone, have kids partner up and run through the sprinkler holding hands. Children (and many adults) often feel more comfortable spending time outside at night when they are surrounded by other people. There’s safety in numbers, after all! Check your community calendar for nighttime band concerts, baseball games, outdoor movies and other kid-friendly outdoor events. Walk there and back if you can, or park a short distance away and take a stroll through the cool night air. Love the children’s book classic, Owl Moon? You don’t have to wait for winter to go owling, just find a patch of woods and perk up your ears. To boost their confidence for this evening outing, familiarize kids with what you plan to do by reading books like Owl Moon and non-fiction children’s books about owls. Practice your listening skills by visiting Audubon.org for samples of actual owl calls. Owls become active around dusk, meaning you can start this activity before total darkness falls. To really help kids feel safe and comfortable, first visit the path you plan to take during the day. If your child becomes scared at night, pointing out familiar landmarks can help. And don’t forget the flashlights! Backyard camping is fun and economical and a great way to practice for future camping trips that take you a little farther away from home. Pitch your tent, pack it with pillows, bedding and flashlights, and enjoy sleepy time while listening to all the nature sounds right in your own backyard. Don’t forget your favorite story time books (just skip the stories about hungry bears and scary werewolves) and bring a deck of cards for a simple game of War, Concentration or Go Fish. As you get ready for sleep, have a contest to see who can identify the most sounds. Is it a frog? A cricket? A cicada? The warm air of summer invites us out, and it is the perfect time to throw down a blanket and enjoy an evening meal or bedtime snack outdoors. Ideal snacks for little ones who experience stress might include avocados (guacamole and chips) and cherries. Avocados contain betasitosteral, a compound that naturally lowers the body’s production of the stress hormone cortisol and cherries contain melatonin, the hormone that helps to ease us to sleep (just remove the pits before serving). There’s something magical and serene about walking beneath a full moon. During the next full moon, plan a walk with your child, taking in your landscape and environment as it is brightened by the moon above. Have fun making moon shadows. Seek out silhouettes of trees, buildings and shrubs illuminated against the night sky. If the moon creates enough reflected light, you may even be able to play catch or Frisbee. For children afraid of the dark, it can be amazing to find out how little darkness there is when the moon is full! Stargazing is a wonderful way to relax and ease away the day’s tensions. 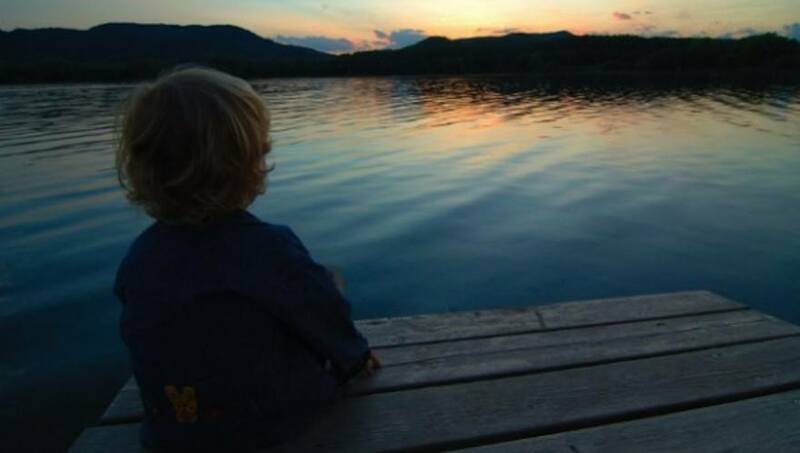 With your child, grab a blanket and sit outside at night, or you may choose to gaze out a window at first. Hunt with your child for the first visible star and don’t forget to make a wish! If many stars are visible, ask your child if all stars look the same. How are they different? (Some are brighter than others. Some look white or yellow. Some even look red). Explain to your child that our sun is a star, but it’s not the biggest star out there. It appears so large because it is the closest star to Earth. Explain to your child that although it is dark where she lives, on the other side of our planet, the sun is shining and children are just beginning their days. This concept, although abstract, can be both comforting and humbling when our children realize the cycles of nature are constant, and that although nighttime can be a frightening time, our side of the Earth will spin its way back toward the sun. At bedtime, pull the rocking chair out on the porch and cuddle your child as together you enjoy the sights and sounds of nighttime. Nocturnal animals come to life after a day of dozing. Crickets chirp and cicadas buzz. Stars become visible. The moon lights up the sky as it reflects the sun. Sit quietly and listen for these soothing lullabies of nature. Discuss what you are seeing and hearing. Doing so will stimulate bonding with your child, while helping him feel relaxed as he tunes into his own sense of sound and sight. Need to refresh your memory about the rules of this summer night favorite? In flashlight tag, “It” has the flashlight. Others scatter. If the flashlight beam lands on you, you’re caught and then you become “It”. Sound way too scary for your child? Enlist his help as your assistant, keeping track of who still needs to be tagged and calling out when someone has been caught. When the game begins, let him know that he can join in anytime he wants, but don’t repeatedly ask him if he is ready to play. If another adult is supervising the game, make it clear that your child should not be pressured to play. Watching day turn into night can feel spooky, so how about watching night turn into a bright, shining morning? Encourage your little one to tuck in extra-early one night so together you can experience an extra-early exploration of what’s out and about in nature as the sun rises. Have a journal handy to take with you on your morning outing, and together, go far a walk, or simply sit and listen. Enjoy the calm of nature as day breaks. Listen for the first bird call, which will soon become a chorus. Watch as the stars fade and the sun glistens off the morning dew. Jot down what your child hears and sees. Let your child draw pictures of what she finds. Enjoy this extra-special way to start your day! Kristen Laine, mother of two and former climbing bum, writes AMC’s “Great Kids, Great Outdoors” blog. Her book American Band, about a champion high school marching band, won the PEN New England / L.L. Winship award for nonfiction. The Family Bed: Is it Right for your Family? Our Favorites for Outdoor Play! Ok, I love these ideas! Many of them are so fresh and new to me, I can’t wait to try them out. We recently went on an overnight camping trip and drank hot chocolate outside in the pitch black dark of a forest (except for our flashlights) and the kids loved it.